Over the weekend, my sister and I dragged Justin on a shopping excursion to J.Crew, where he quickly learned that "just browsing" is merely a polite way of saying... "get comfortable." As usual, I was overwhelmed by all of the amazing summer styles and overly colorful pieces lining the walls. My final purchases consisted of this sweater and neon skirt, but while standing in line I couldn't help but imagine if I won the lottery and the completely glutinous shopping spree that would follow... A girl can dream right? 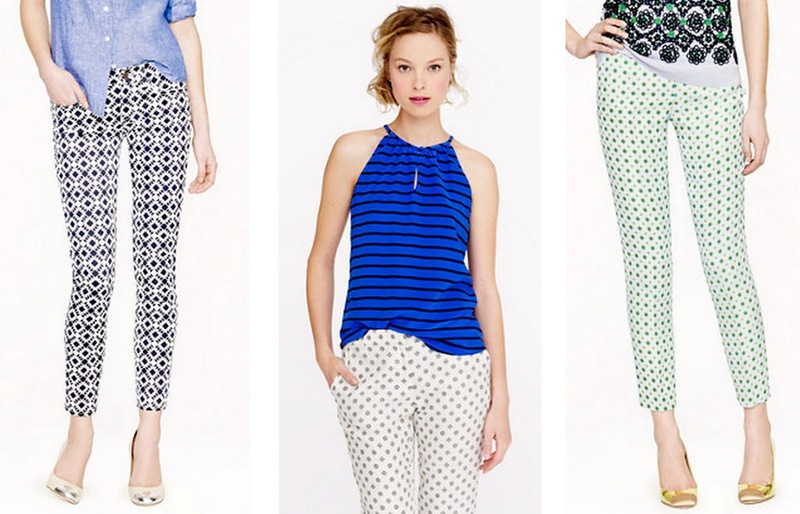 For now, I'll stick to lusting over my favorite J.Crew pieces. Below are some of the items topping my extra long wishlist. Which pieces are catching your eye? Loving all of these pieces? Don't forget to take a second to enter my $1,000 J.Crew gift card giveaway here. Hi Anna! Thanks so much for stopping by my blog. I LOVE this look. The whales are so adorable and you've paired them with such an amazing skirt! I'll have to add that skirt to my summer wardrobe asap :). Following you already via Bloglovin. Have an amazing week girl! Don't miss today my Comfy look....with amazing Glitter top and New Jeans. I love this outfit! and I love that skirt!!!! Yellow and navy is such a great combination! I love the little whales on the shirt! How cute?!? amazing purchase. Love the whole outfit. The whale sweater is so pretty and I LOVE this absolutely stunning yellow skirt. adorable. wish you a great day lovely Anna. The sweater is just SO adorable!!! Love it with the neon skirt. This whole outfit is just pure love - if I could add an emoji on my laptop, it would be the smiley face with the hearts for eyes, haha. so cute! wonderful skirt. so pretty- i love neon. Great buys on both the sweater and the neon skirt. You look awfully summery, and I'm so envious. I want summer to come as soon as possible. LOL at your "get comfortable" comment. =) I was just admiring that sweater myself! I love your skirt and the shoes are ADORABLE. wow what a great post! I really love your skirt, I just wish your pinterest logo wasn't so big and centered on your photos because it is slightly distracting. Lovely! Wow I love the skirt! This is an adorable sweater. I love how whimsical it is. You styled it perfectly. Can't wait to see how you style it next. Thanks for stopping by my blog and leaving such a sweet message. This totally made me laugh because I do the same thing to my husband :) That skirt is gorgeous on you, and love it with the whale print! hahah this is cute. M's figured out my tricks -- he doesn't even go to the mall with me anymore. thanks for following along on my blog. love your sense of style! I love J.Crew! You picked well :) I can't wait for them to open in London later this year. I am SO stealing your skirt! Obsessed! I love that sweater, so cute and fun! I just did a little online J.Crew shopping last night...so many great finds right now! OMG I love the outfit, looks perfect, the skir is amazing! Such a cute top ! WOW I want that top! And I love your wedding ring! You look adorable. 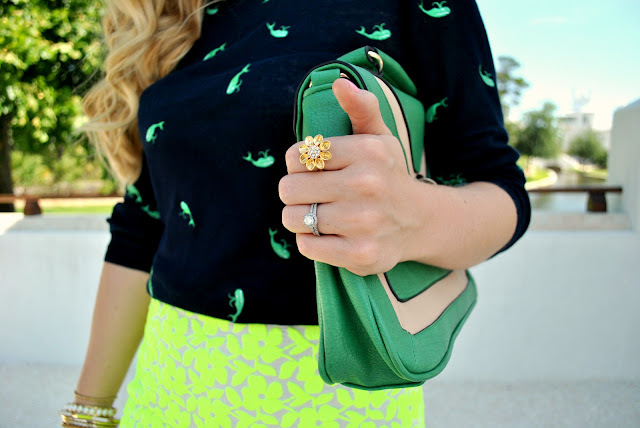 Love the whale print and the neon skirt is fab! I love that skirt!! I mean could it be any more perfect? love the whale sweater, very cute on you! Hope all is well love! Great outfit. Too cute. 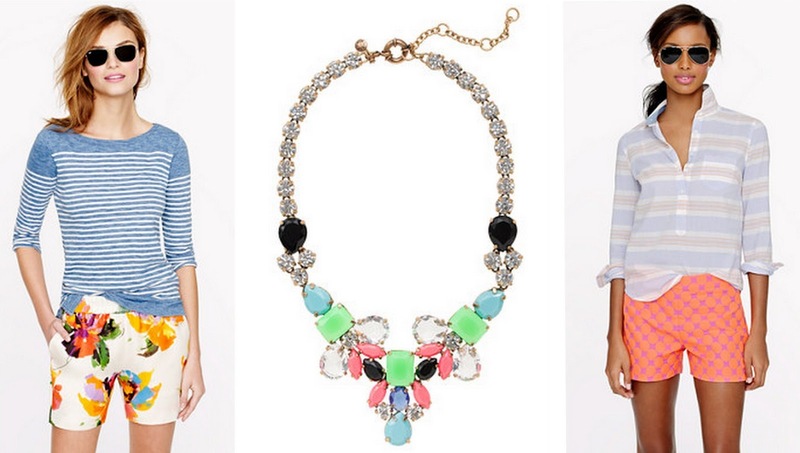 I love the blue striped shirt and the fabulous statement necklace. Don't forget to stop by and link up tomorrow on my Tres-Chic Fashion Thursday Link Up and enter my stella & dot giveaway. I love this! The colors are so bright and vibrant. Great look my dear! I love it! SUCH a stunning skirt! Apparently I need to pay J.Crew a visit!! Love the neon skirt! It really adds a pop! I love how crazy bright the skirt is!! love so much your outfit!! I love everything about your outfit as well as the printed pants in your wishlist! 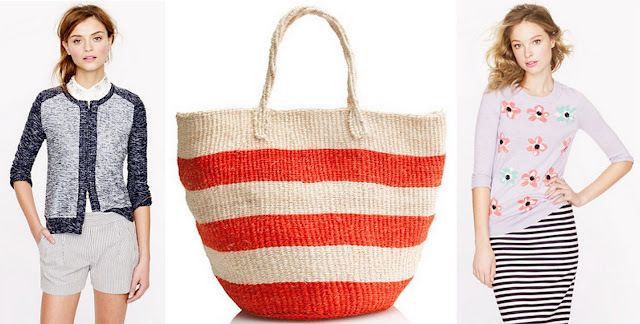 It seems that I can always find something I "need" when I walk into J Crew! I love this neon skirt, gorgeous! Love your perfect hair style! Gosh! Definitely that neon skirt! =D Can't miss it! THAT SKIRT and whale top are AWESOME! OMG the whales!!!! I am in love. Cute as always, girly! that sweater is the cutest. and i totally love everything at j crew! It's impossible to "just browse" at J Crew! They have the magic formula for making us crave almost the whole store, great purchases beautiful, drooling over your skirt! Another amazing skirt! Loved it. This is SO cute! I love that shirt and skirt together. This has for to be one of my favorite looks by you!! You look amazing! Love the neon and green and whales! How adorable is that whale sweater?! Great find! I think I would go crazy in JCrew if I won the lotto. That whale sweater is so cute! I agree, J Crew is SO hard to shop in! I was actually just there today and had to talk myself out of buying the store! And your hair looks gorgeous here, tutorial soon? ;-) I would love if you could stop by my blog! I cannot get over how amazing this look is! Definitely a favorite! That skirt and those shoes are gorgeous. yep another ridiculously adorable outfit! J Crew is my weakness. I go to the dressing room with my arms full and have to cut it back to a few items because I want everything! Ahh Anna I'm obsessed with this look! What a darling sweater, love the nautical neon look! Love how you style it with the neon blue! I just styled my J.Crew whale sweater with some bright colors in my recent post here too!